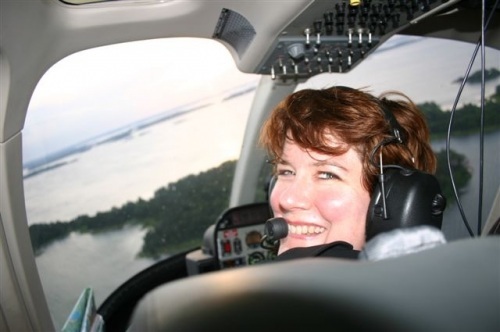 In this photo taken by my friend Pingis, I am flying in a helicopter over the archipelago on my way back into Stockholm. Feeling like a rock star, we landed on a pad in the Baltic just next to the city’s Old Town. How cool is that? I love to write. And for 25 years, I’ve been fortunate to make my living as a professional writer and editor, and have spent most of my career working on magazines. I also love to travel and to talk about travel, making me perhaps your worst nightmare at a dinner party, but a good source of info if you want to know where to eat or drink in a city. For as far back as I can remember, I dreamed of leaving my Midwestern roots behind and living abroad. So when my Australian husband Robert and I together decided we would move to Europe, London, Paris, Sydney, Florence and Barcelona all came to my mind. But perversely, the city that was never on my radar – Stockholm – was somehow where we ended up in September of 2004. It’s a good story. And one you can find out about in my book, Going Viking, which you can read about in brief below and in more depth on the About the Book page. I’ve developed a love/hate relationship with my adopted hometown. Basically, this means that I love it during the long days of almost total light in the summer and hate it in the long and dark winter. Luckily, I’ve done enough traveling to other countries, both near and far, to balance me out, mostly. Australia and the US are regulars in my travel rotation and I’ve gotten in trips to New Zealand, South Africa, Hong Kong, Singapore, Shanghai and Beijing, as well as Iceland, Finland, Denmark, Estonia, Norway, Germany, England, Scotland and Ireland, as well as further south to Italy, Spain, Portugal, France, Belgium, Germany, Austria, Luxembourg, the Czech Republic and lots more. Career-wise, I spent 16 years at F&W Publications, working my way up from intern to editorial director of the art magazine group. For many years, I was paid to judge, look at and speak about art in my role on The Artist’s Magazine. (That was a good gig!) Here in Stockholm, I had the equally cool job of getting to write about travel as the editor in chief of Scanorama, the in-flight magazine for SAS. Now I’m an editorial consultant and writer and work in corporate communications at Electrolux. And that is also a good challenge. I am also available for freelance writing, editing and consulting assignments, guest blogging, public speaking, and press trips. 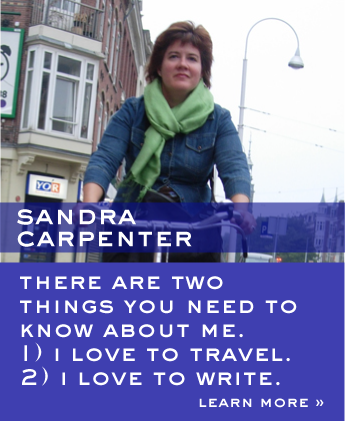 I live in Stockholm, but travel regularly and can be reached at sandra@sandracarpenter.net and on on Twitter @Sandrastravels. My not-so-secret passion has been writing a book. It’s called Going Viking and shares the story of what happens when I give up my cushy career and life in Cincinnati to follow that dream of living in Europe and traveling the world. Perhaps inevitably, it all goes bad quickly thanks to the not-too-pretty reality of me trying to learn Swedish and fit into the culture. To find out what happens next, read the book. (Did you really think I would give away the ending here?) I will tell you that travel helps. South African safaris, four-wheeel drive treks in the Australian outback and dog sled races across the Arctic are just a few of the adventures that provide adrenalin-pumping relief. As for the more fun stuff about me, I tend to listen to alternative music and am just now loving Sweden’s Peter, Bjorn and Jon as well as Lykke Li and First Aid Kit. From there, it’s the Dandy Warhols, the Coral, Manu Chao, Gipsy Kings, Adele and Nick Cave, but the list is always changing. I’m a big fan of riding my bicycle, but winter in Stockholm dictates that I switch to spinning class indoors during the winter. Food wise, I love salsa and guacamole and think that just about any meal is better with chili peppers, cilantro and lime added to it. A good glass or two of cabernet sauvignon always makes me happy. My husband Robert is my willing partner in adventure and even after 11 years of marriage, he is still willing to put up with me writing about him.